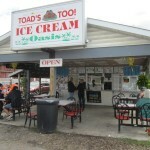 Family owned and operated, Toad’s Too has been serving quality dairy desserts since 1993. Carrying over 45 types of hard and 65 soft ice cream, including Sherbet, yogurts, no sugar added (NSA), sorbet, Lactose free vanilla and Dole Whip, cones, dips and many toppings to please any one. 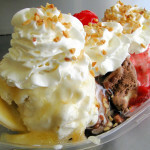 Try one of our specialty sundaes like The Monkey, Worms & Dirt and Chocolate Squirrel or retreat to an old fashioned Banana Split, Mexican or Dusty Miller. There are shakes, ice tea, soda and lemonade too, all at reasonable prices. Proudly serving products from Gifford’s, Hood, Perry’s and new this year Bassetts Hard Ice Cream. Hot foods include homemade BBQ pulled pork sandwiches, Hofmann hot dogs and corn dogs. Relax with your treat under the covered porch or in the garden. 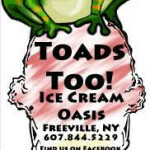 Toad’s Too is open 7 days a week from spring to fall 12 noon to 9 pm (sometimes later) – located on Route 38 in the Village of Freeville, only 3 miles from Dryden. Handicap accessible. Open through September!